The summer is ending and cheerleading camps are coming to a close. So whats next? Many of you are getting ready to go back to school and start up football season! Whether this is your first or last year cheering, here are some tips that will help you have a great cheerleading season! Whether it is football, baseball, basketball, or any other sport that your team cheers for, it can be tiring cheering through an entire game. Make sure you drink plenty of water during your breaks (or time-outs.) This will help keep you hydrated, so you can keep up the spirit that every good cheerleader needs! Also, it is very important that you stay in formation and stand at attention until the captain calls the next cheer. (Usually, this will exclude half-time.) It looks very unprofessional and sloppy when cheerleaders talk and move around in between cheers/chants. Believe it or not, at least one person in the crowd is watching you at all times during the game, so make them proud! Also, if you mess up at any time during a cheer or half-time routine, make sure you smile and keep going. Dont make a big deal out of it, because nine times out of ten the audience wont even notice the slip up. 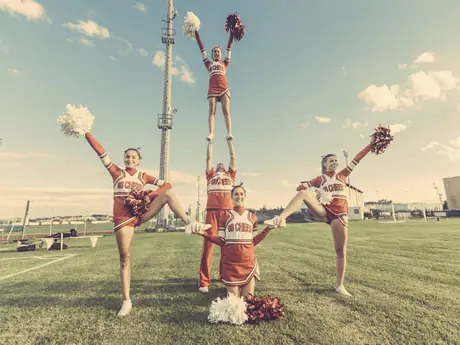 If your cheerleading squad decides to compete this year, then you will probably start working on your competition routine either during summer or the beginning of the school year. This can usually be a very stressful time, so its important that you dont get frustrated if the routine is harder than youd hoped. After all practice makes perfect! The harder you practice, the easier the routine will seem. So make sure you stay focused and keep your chin up, because in the end, all of your hard work will be worth it! Find a cheer camp or team near you.